The patented complex molecules, specific to each diffuser, neutralized bad odors in a targeted manner by blocking their olfactory perception. The addition of aromatic notes reinforces the effect of neutralization of any unwanted odors. 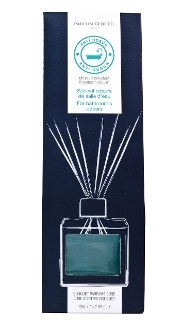 Synthetic polymer black diffuser sticks allow a faster and more intense diffusion of the fragrance. Contemporary teal glass cube topped with a silver ring. Capacity 125ml (4.2oz) Aquatic Fragrance Top Note: Aromatic notes, Lavender Heart Note: Eucalyptus, Marine notes Base Note: Patchouli, and Oakmoss.